“I have said this before, but I shall say it again and again and again: Your boys are not going to be sent into any foreign wars.” - President Franklin Delano Roosevelt, Campaign Speech in Boston, October 30, 1940. Of course, all that changed on December 7th, 1941. Seventy years later, Americans are about to receive another historic surprise. At the cusp of a global debt wipeout, most have their recently reduced savings in bond funds. Conditions have been building for a cascade of defaults, but it won’t be until we are in the thick of it that it will have seemed so obvious. 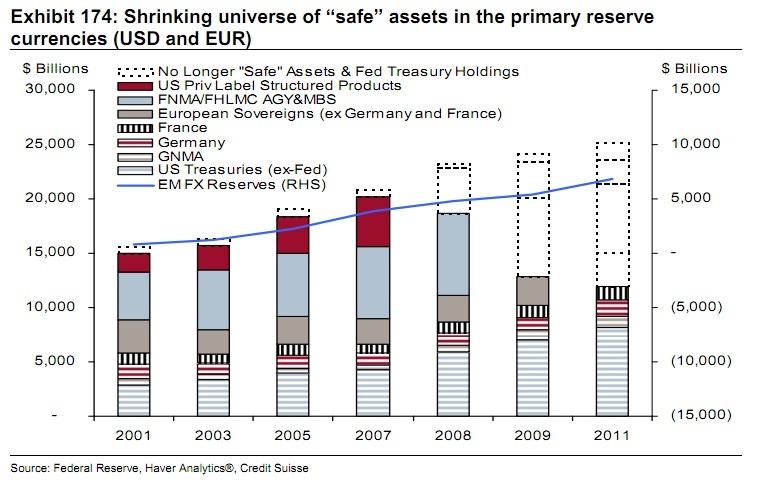 For all those who believe that a policy of money printing can prevent defaults from happening…You need to wake up. History is filled with events, like Pearl Harbor, that are beyond our government’s control. Yet most are invested with the belief that the government will be able to prevent the leverage in the global financial system from toppling. "I believe America is on its way up." – President Barack Obama. Campaign Speech in Kansas, December 6th, 2011. Since 1980, interest rates have been trending lower. Lower interest rates encourage increasing debt. Eventually, debt levels get high enough so that they cannot be serviced and defaults occur. While some defaults occured in the the last financial crisis, we did not reach the tipping point. Governments also provided more ‘income.’ But this time, governments are being questioned on their ability to pay. Just like the mortgage crisis in 2008, the weakest go first (PIIGS – Portugal, Ireland, Italy, Greece and Spain). We have expected this as far back as early 2010 (here and here). Also, just as the entire mortage market was engulfed by the subprime crisis (no, it was not contained), the more respectable credits will be eventually questioned: France, the UK and Japan. That’s a lot of money moving into the haven of the U.S. In addition, as Barbara Ridpath, chief executive officer of the International Centre for Financial Regulation, states; “There aren’t enough assets in the world that are genuinely liquid and of high enough quality to allow all the banks to meet this ratio.” The ratio she is reffering to is the ‘liquidity coverage ratio.’ It is basically the cash reserves the banks will need to hold for regulatory purposes. Looking at the chart below, you can see what was highly rated and liquid has either defaulted, rolled off or froze. Almost all who direct investments at Wall Street firms have no idea what they are doing – they are empty suits. They must rely on advanced degrees in failed economic theory, pomp and even adolescent social tricks to maintain their power over their hapless clients. This self-aggrandisement crumbles when their investments come under fire. Since their strategy has always been to go through the motions and hope, when the real selling starts they freeze. As the proper strategy is to move forward, their clients become sitting ducks. Under fire, clients will ask ‘What are we doing?’ But there is no credible plan. In the last financial crisis they were taught to wait for a bailout. Now bailouts are ineffective (the problem is just too big, complex and fast). Wall Street firms’ clients are forced to take cover on their own. Investors’ overvalued stocks and bonds are like a building with a caved in roof. That building needs to be gone – liquidated. Keep it moving. Forget about going around looking for yield on cash equivalents. Cash only yields zero when you actually need it. Keep moving forward. U.S. Treasury Bills not only provide liquidity and protect principal, they run circles around other asset classes in a financial crisis.